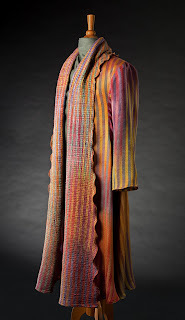 This coat, "Summer's Lease I," was juried into the fashion show for the Handweavers' Guild of America's 2018 conference, Convergence, held in Reno, Nevada. I wove this on my 12-shaft Macomber loom, using two hand-painted warps of 20/2 silk wound together and woven in Echo Weave and Turned Taquete. 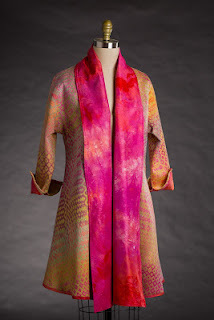 The lining is hand-dyed Habotai silk and the pattern is my own design, based on a swing coat that I own. This outfit was also juried into the Convergence fashion show in 2018. 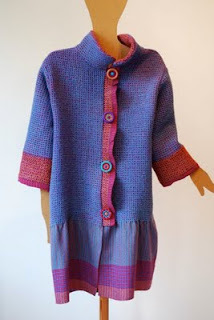 I wove it on the same warp as my coat pictured above, using my own designs for the top and the skirt. 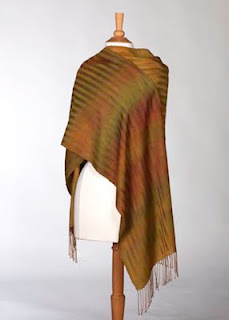 The top is Rep Weave, with alternating wefts of 60/2 silk and bias-cut Habotai silk ribbon, hand-dyed in golden orange. The skirt is cut on the bias and made of a fabric woven in Echo Weave. 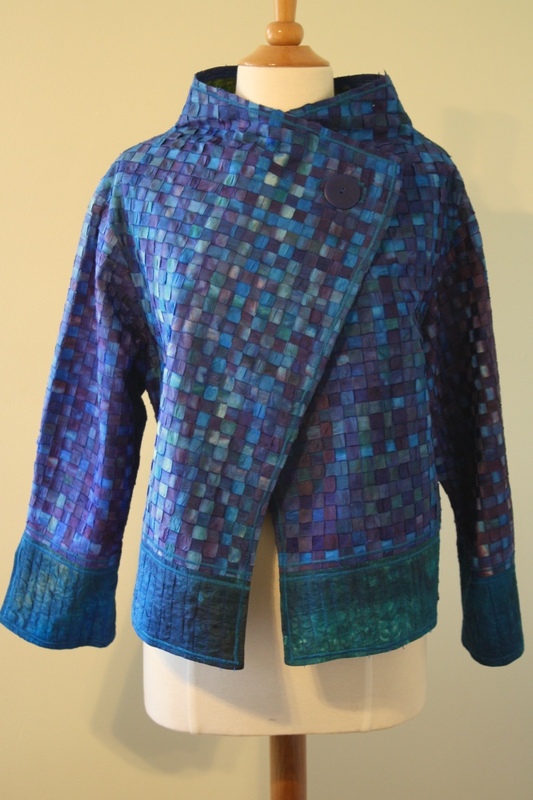 This jacket, named "Blue Rills" after the ripples in the design, was juried into the 2016 Handweavers Guild of America fashion show, "Moving Forward," in Milwaukee. The event is the HGA biannual convention, Convergence. 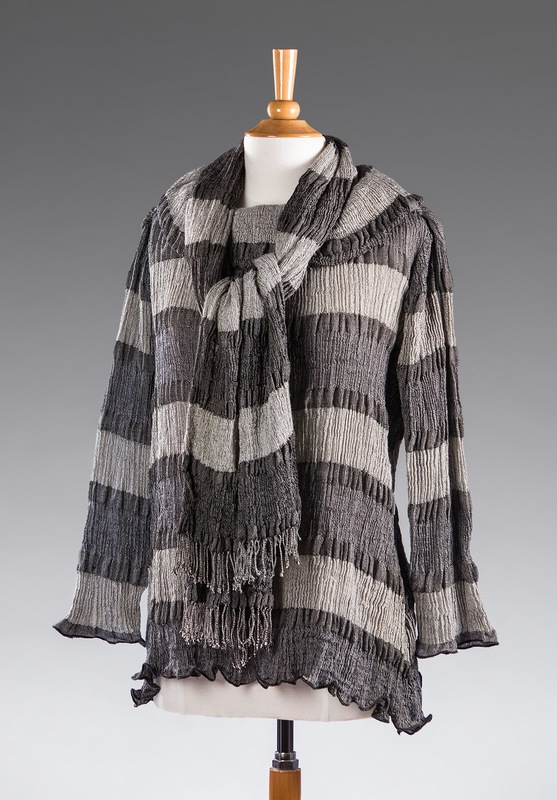 The fabric is an 8-harness deflected double weave, woven in 18/2 merino and 20/2 cotton. I painted two warps (the cotton and the wool) in two different color palettes using MX Fiber Reactive dyes. 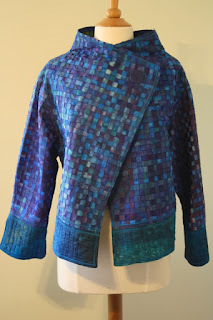 The jacket pattern is by Marcy Tilton. 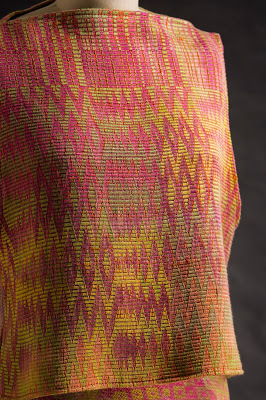 The second piece, also juried into the Convergence fashion show, is plain weave -- although it may not appear to be -- with a 60/2 silk warp in alternating black and white threads. 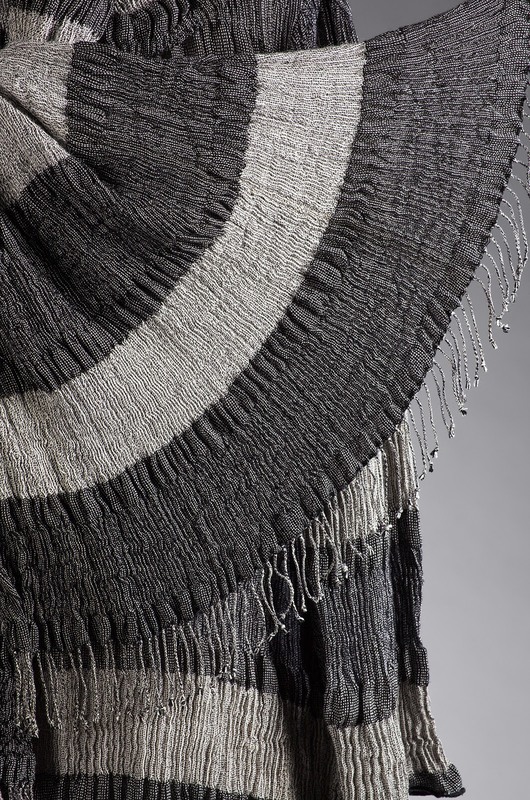 The sett is fairly loose to allow the weft yarns to collapse, making the fabric crinkle. I used three different wefts: 60/2 silk in black, 60/2 silk in white, and 30/1 wool overtwist. This pattern is also by Marcy Tilton. This coat, handwoven of 60/2 silk, was juried into the 2014 Convergence fashion show, sponsored by the Handweavers Guild of America, to be held in Providence, Rhode Island, in July. I handpainted two warps in two different colorways: one in a range of sky blue to aqua to pale green and the other in a range of chocolate-brown and mahogany. 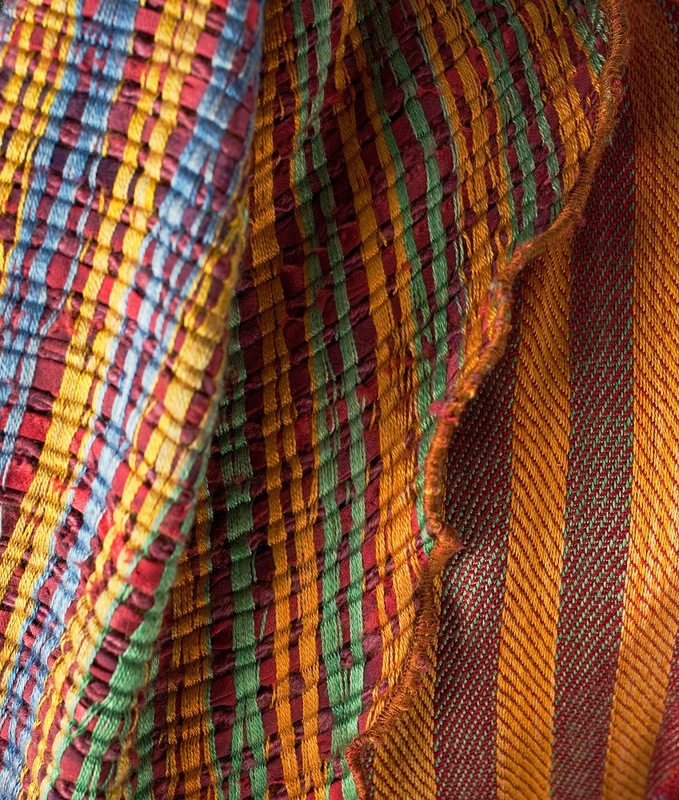 It's woven in blocks of 3/1 and 1/3 twill, so that the stripes tend to collapse and pleat. 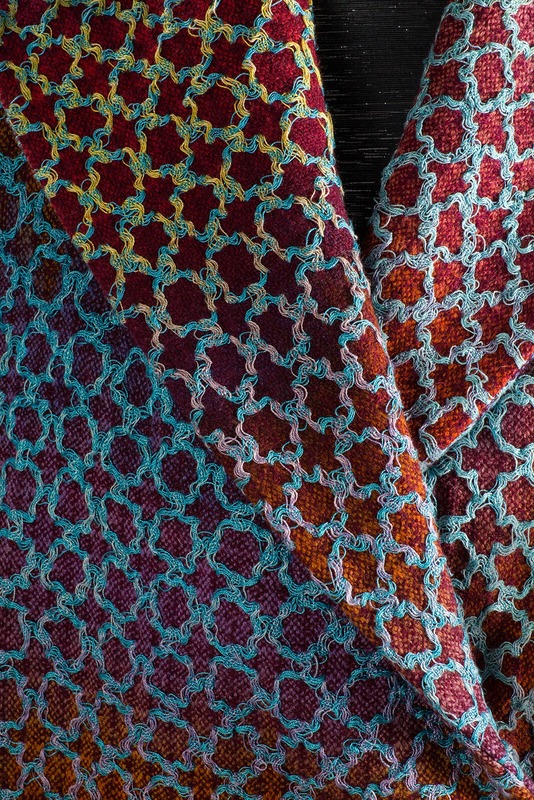 The collapse-weave effect is intensified by weaving with a gossamer-weight weft of overtwist wool, which scrunches and relaxes after washing. A hand-knitted, beaded silk-ribbon flower is the closure in front. 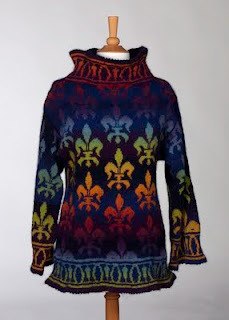 The pattern is my own design, based on a shawl-collar coat that I own. 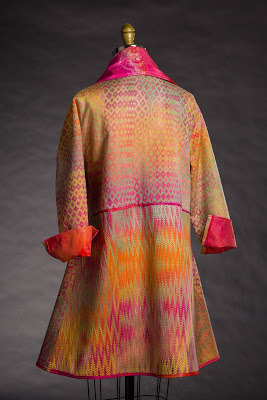 This coat was juried into the 2012 fashion show for Convergence, the biennial international conference sponsored by the Handweavers' Guild of America. This year's show and exhibit take place in July in Long Beach, California. 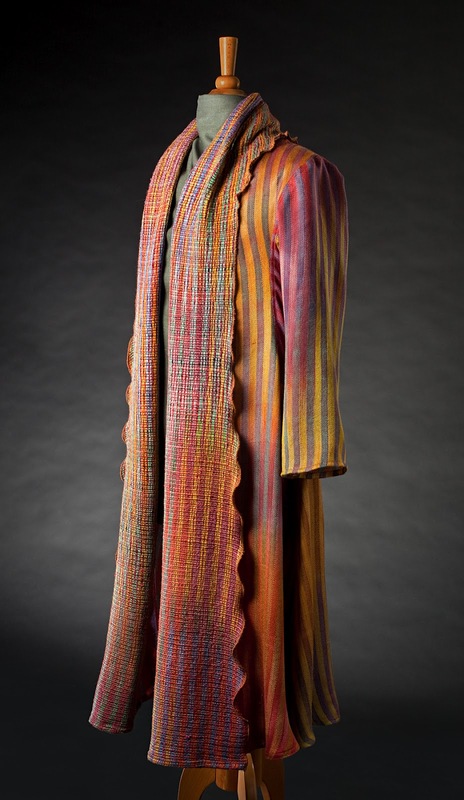 It's titled "Sunrise Sunset Coat," marking the changes this winter in the lives of my family. It's dedicated to my father who went into long-term care at a wonderful nursing home, Penfield Place, in Penfield, New York. I used two different wefts: one of hand-dyed 60/2 silk (on the right side of the photo above) woven in stripes of 3/1 and 1/3 twill and the other of Habotai silk ribbon and handspun merino (on the left in the photo) dyed a deep burgundy and woven in plain weave. 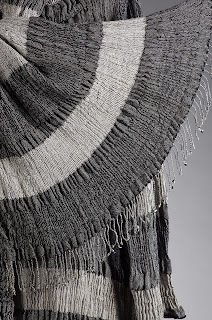 I love the way the warp flows every which way in the plain-weave fabric, which resembles a rag rug. 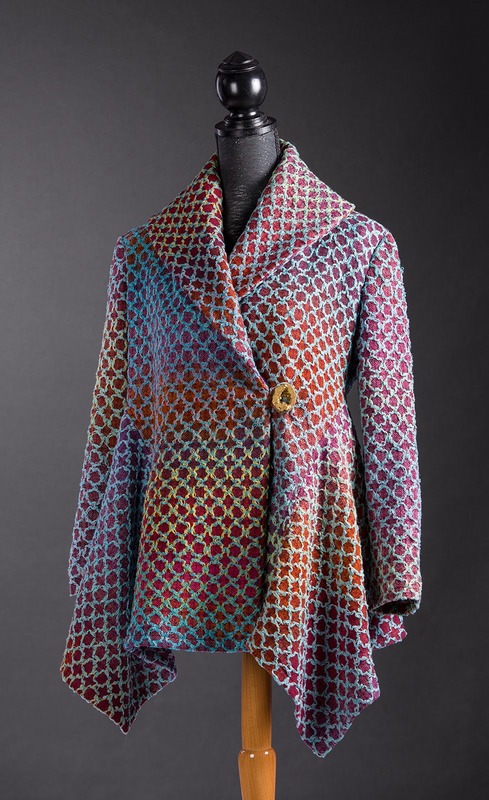 The pattern is by Issey Miyake, Vogue 1069, now out of print but still available from the Vogue website. 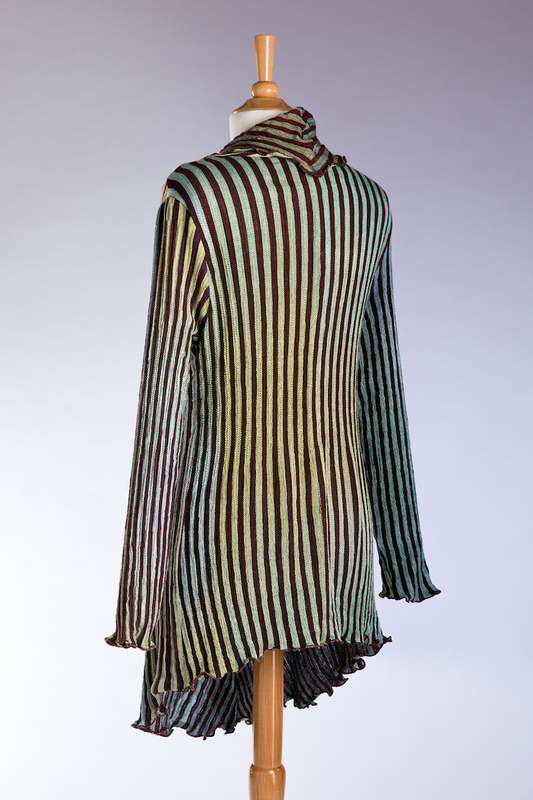 It has a wonderful construction that drapes beautifully and flows gently over the body. This coat was exhibited in the Weavers' Guild of Rochester's 65th anniversary exhibit, "For the Love of Fiber," and received the Handweavers' Guild of America Award. It's woven in a 6-harness waffle weave and plain weave, with handmade Dorset Buttons. The fiber is 18/2 merino from JaggerSpun Yarns. This shawl appeared in the fashion show during Convergence, the 2010 Handweavers' Guild of America biannual conference held in Tampa, Florida. 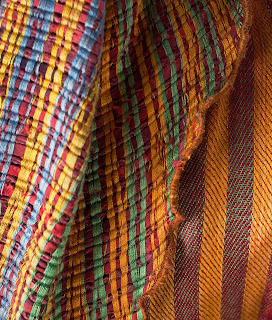 It's woven in 3/1 twill blocks using 60/2 silk. 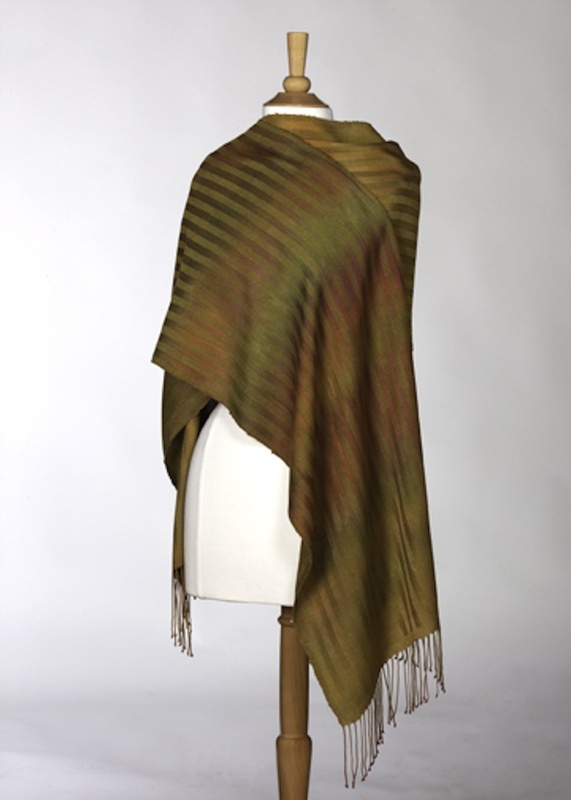 The warp is hand painted and the weft is hand dyed. 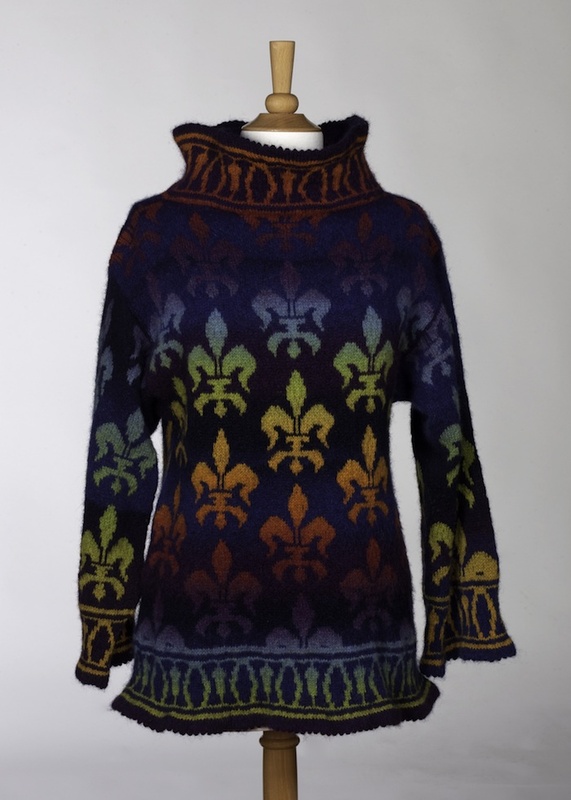 This sweater is my own design and appears in the online knitter's community, Ravelry, as a free pattern download. The yarn is Kauni Effektgarn in two colorways. 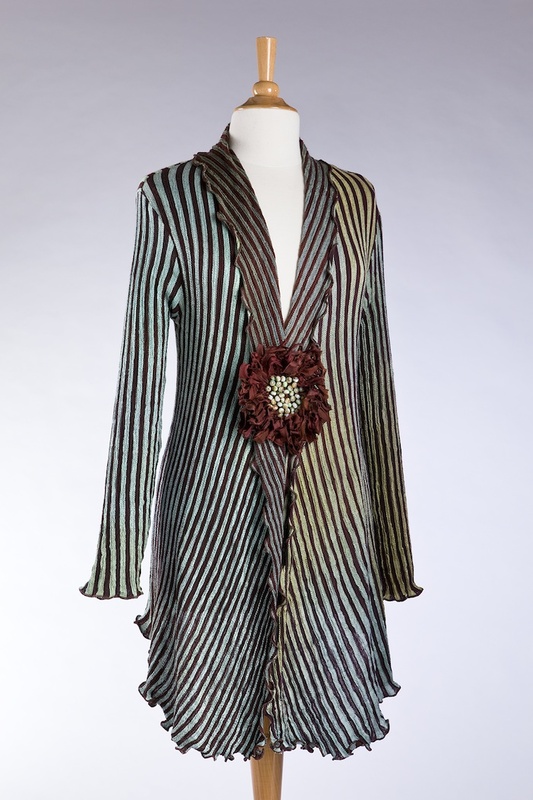 This jacket appeared in the Convergence fashion show in 2008 in Albuquerque, New Mexico. The fabric was woven off-loom in hand-dyed Habotai silk ribbon, which was then quilted onto a base of hand-dyed Habotai silk.